Congresswoman Michele Bachmann is being called the “Queen of the Straw Poll” after her victory at the Iowa straw poll yesterday for the GOP presidential nomination. Bachmann, who finished with 4823 votes, narrowly beat second-place finisher Congressman Ron Paul who collected 4671 votes. The Ames poll, although important because of the early significance of Iowa in the primaries, is nonbinding and unscientific. 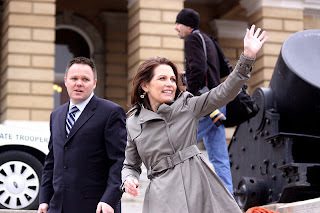 Therefore, Bachmann appears to have rigged the vote at a minimum direct cost of $120,000 to her campaign. It’s unclear whether any of the other candidates engaged in this same behavior. Another anomaly with the vote surfaced this morning when it was discovered that 218 votes went unaccounted for. In other words, these votes were in the overall tally but not registered to any of the candidates. One would think the media would attempt to uncover the discrepancy given the razor thin 152-vote margin between Bachmann and Paul. However, so far, they’ve been content to call her the “queen” of the event.